ANN ARBOR, Mich., March 18, 2019 /PRNewswire/ -- Basketball fans rejoice: Domino's Pizza (NYSE:DPZ), the largest pizza company in the world based on global retail sales, is celebrating college basketball's biggest month by offering 50 percent off all menu-priced pizzas ordered online today through March 24. "What's better than cheering on your favorite basketball team?" said Jenny Fouracre, Domino's spokesperson. "Cheering on your favorite team while enjoying some delicious, hot, 50-percent-off pizza." The 50 percent off deal is available on menu-priced pizzas ordered through any of the following Domino's online ordering channels: www.dominos.com, Domino's mobile app, Google Home, Amazon Alexa, Facebook Messenger and voice ordering with Dom. Domino's sold more than 2 million pizzas during the 2018 semifinals and championship game night combined – enough to give more than 27 pizzas to each person attending the final game in Minneapolis this year. During the 2018 college basketball tournament, Domino's produced enough dough to match the weight of nearly 22 million basketballs. Founded in 1960, Domino's Pizza is the largest pizza company in the world based on retail sales, with a significant business in both delivery and carryout pizza. It ranks among the world's top public restaurant brands with a global enterprise of more than 15,900 stores in over 85 markets. 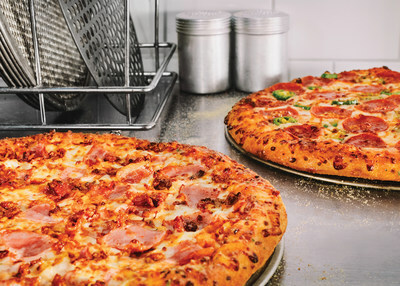 Domino's had global retail sales of over $13.5 billion in 2018, with nearly $6.6 billion in the U.S. and more than $6.9 billion internationally. In the fourth quarter of 2018, Domino's had global retail sales of over $4.2 billion, with nearly $2.1 billion in the U.S. and more than $2.1 billion internationally. Its system is comprised of independent franchise owners who accounted for 98% of Domino's stores as of the fourth quarter of 2018. Emphasis on technology innovation helped Domino's achieve more than half of all global retail sales in 2018 from digital channels, primarily online ordering and mobile applications. In the U.S., Domino's generates over 65% of sales via digital channels and has produced several innovative ordering platforms, including Google Home, Facebook Messenger, Apple Watch, Amazon Echo, Twitter and text message using a pizza emoji. In late 2017, Domino's began an industry-first test of self-driving vehicle delivery with Ford Motor Company – and in April 2018, launched Domino's HotSpots®, featuring over 200,000 non-traditional delivery locations including parks, beaches, local landmarks and other unique gathering spots.